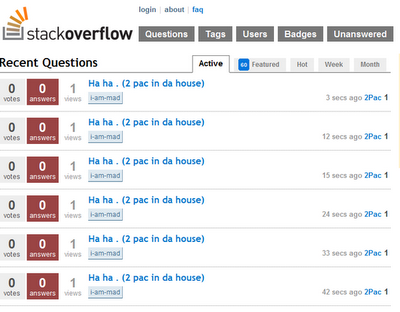 I got almost annoyed with the continuous spamming (still happening at the time of writing) at Stack Overflow. More than anything else, this seems like a limitation with the system itself, which don't seem to have any built in support for preventing spamming. Well, I know this is very easy to say this, than doing - I also know Jeff and all are not short of ideas, but here are few quick features we need in Stack Overflow asap, so that a lot of us can still continue using that. The message contained abusive text, but from the behavior, I infer it is pretty human, it is not an automated bot. Update: Seems like SO is working good now, after being down for some ten minutes. The spamming trend lasted for close to 30 minutes, and then Pretty good recovery, but need to think how to prevent this in future.